Smallpox was introduced to Hawai‘i by an American merchant ship, the Charles Mallory, sailing from San Francisco and arriving at Honolulu Harbor on February 10, 1853. Displaying a yellow flag indicating a serious infection on board, the ship berthed in isolation on a reef off Kalihi. One of the passengers had smallpox. When the period of quarantine ended in late-March, no new cases had been reported, the smallpox patient was recovering and the ship set sail and left. In May 1853, the disease reappeared. Two native women were stricken; their homes and the adjacent properties were cordoned off and their infected clothing and grass huts were burned. This time smallpox spread rapidly; cases were reported from most of Honolulu’s districts. In response to the growing impacts, June 15, 1853 was declared a national day of mourning, prayer and fasting. The epidemic was at its worst in July – August with the island of O‘ahu recording more than 4,000-cases and 1,500-deaths. Despite efforts to contain it, smallpox spread to Kaua‘i, Maui and Hawai‘i, killing at least 450-people. The people on Ni‘ihau, Moloka‘i and Lāna’i remained protected because of their remoteness, stricter quarantine and better vaccine quality. Missionary Dr. Dwight Baldwin was the government physician for Maui, Moloka‘i and Lāna’i during the smallpox epidemic. Due to his vigilance, the number of smallpox deaths on these islands was only 200 deaths. Statewide, during an eight-month period, about 8% of Hawai‘i’s population died of the disease. When the epidemic ended late in January 1854, the estimated number of statewide cases was 6,400 – 9,100 and an estimated 2,500 – 5,750 deaths. The intensity of the epidemic led the Hawaiian legislature to make vaccination mandatory for both residents and visitors in 1854. Smallpox is a serious and contagious disease due to a virus, causing illness and death wherever it occurred. It mainly affected children and young adults. Family members often infected each other. Smallpox localizes in small blood vessels of the skin and in the mouth and throat. In the skin, this results in a characteristic rash, and later, raised fluid-filled blisters. After a twelve-day incubation period, patients developed severe headaches and backaches, a high fever, and chills, followed by a severe rash, a return of the fever, and bacterial infection. Death came by infection of the lungs, heart, or brain. The entire course from infection to death usually took five or six weeks. Smallpox spreads easily from one person to another from saliva droplets. It may also be spread from bed sheets and clothing. It is most contagious during the first week of the infection. It may continue to be contagious until the scabs from the rash fall off. 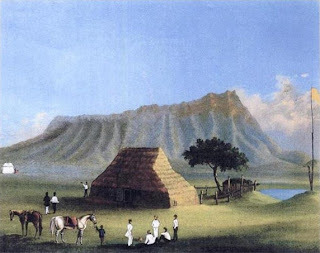 It is reported that the Honuakaha Smallpox Cemetery (near South Street and Quinn Lane in Kakaʻako) has more than 1,000 burials from the 1853-1854 smallpox epidemic. Because of the smallpox epidemics a Small-Pox Hospital opened. Likewise, over the years a small island in the reef across from Downtown Honolulu was used as a quarantine site. The image is of the Smallpox Hospital, drawn by Paul Emmert (ca 1853-1859.) In addition, I have included some other related images in a folder of like name in the Photos section on my Facebook page. What Do We Do With Agricultural Land?